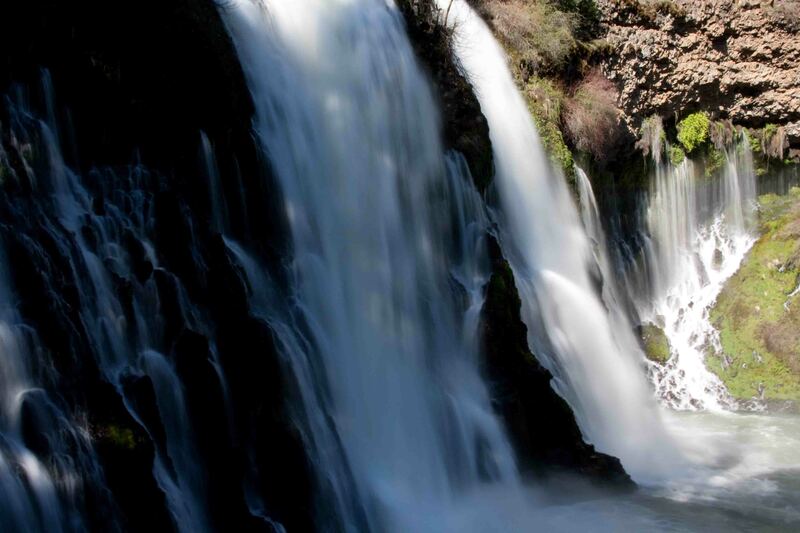 So I really couldn’t get enough of Burney Falls. It’s one of the few places where I could have sat all day just to find the best time to photograph it. It seems it affected others the same way. 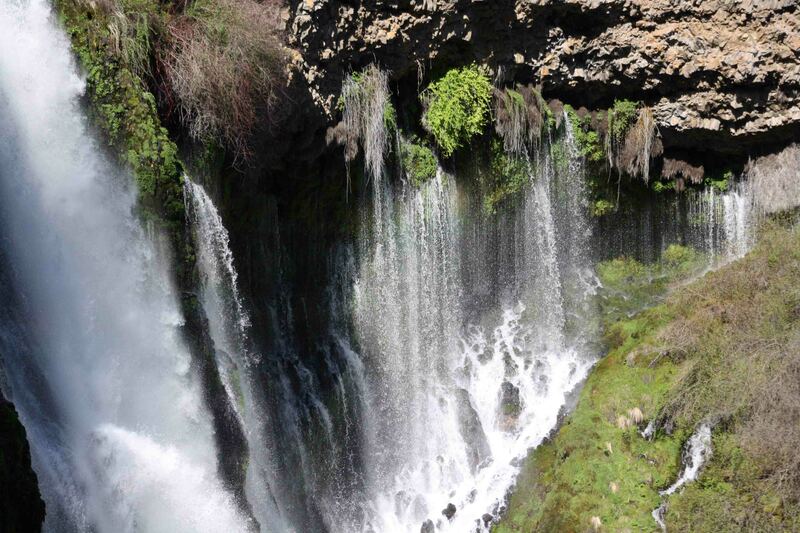 To the Pit River Indians, Burney Falls is a sacred place. Theodore Roosevelt called it the eighth wonder of the world. The McArthur family believed so strongly that the falls should be protected, that they purchased the land and sold it to the state. 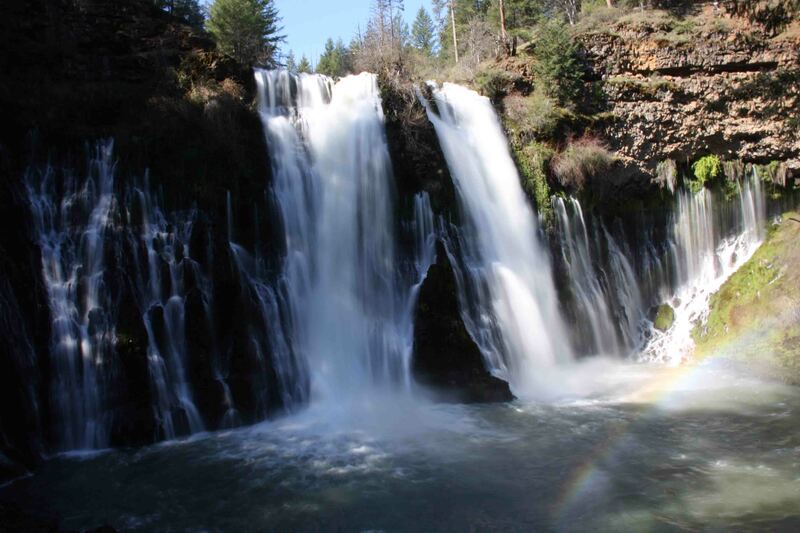 Thus the McArthur-Burney Falls Memorial State Park, established in 1922, became the second oldest park in the state. This morning was a lovely time to admire the falls. The sun was out and shining on the mist rising from the spray as it plunged into the pool below which created a rainbow. Water poured out of rock crevices to each side of the main falls and trickled down the moss covered rocks. A few of the black swifts, which make their home behind the falls, were flying around the crest of the falls. In fact, due to Burney Fall’s dependable water flow, it is one of the most important breeding locations for black swifts in the western United States. After fiddling with several different settings on my camera, taking countless pictures from the shade onto the bright falls, and for the most part staying protected from the spray, I decided to walk the Burney Creek Trail which leads to the headwater pool where the water comes up from the springs from underground. It would be neat to come back here when the creek above the pool was dry to see the water coming from below ground. Today, the creek was roaring from the winter snow melt. 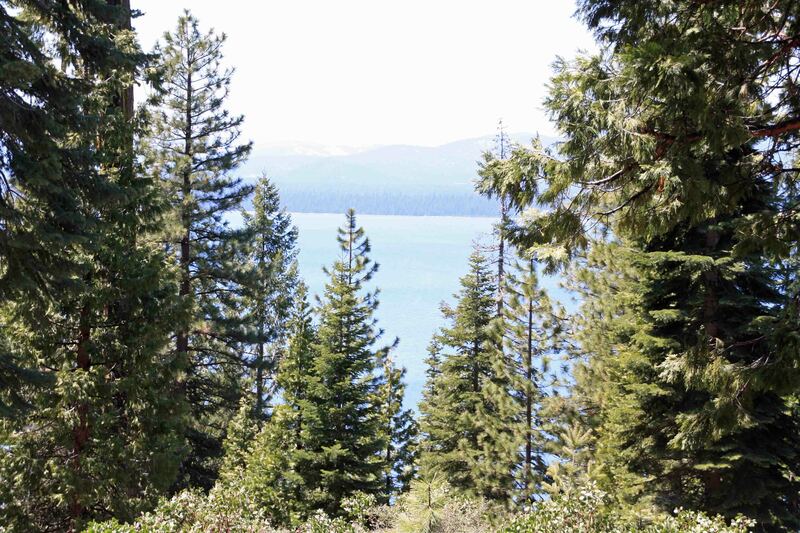 We finally left the park late morning and started toward Lake Almanor and Lassen Volcanic National Park. We passed by blue lakes, rolling green hills and farmland. As we slowly gained altitude, from 3,000 to 4,000 feet, patches of snow dotted the hills and ice covered portions of the lake. 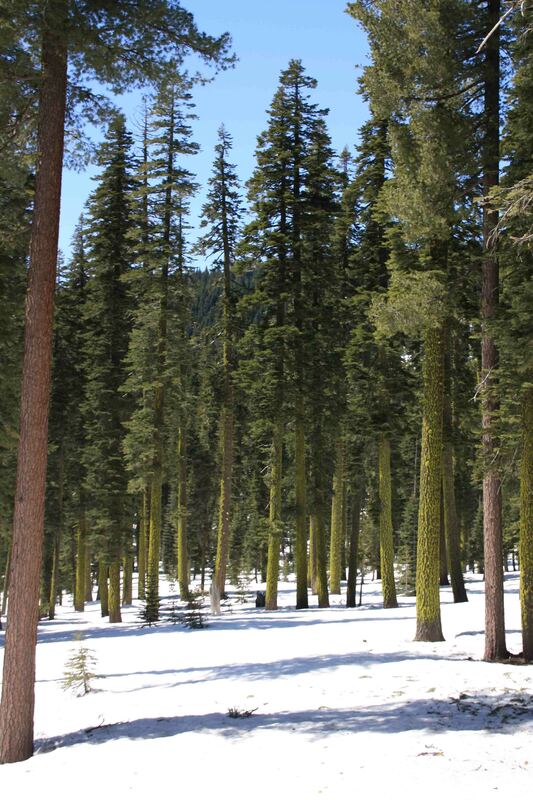 As we climbed above 5,000 feet, pine forests were blanketed in snow and signs warned that Highway 89 was closed through the park. 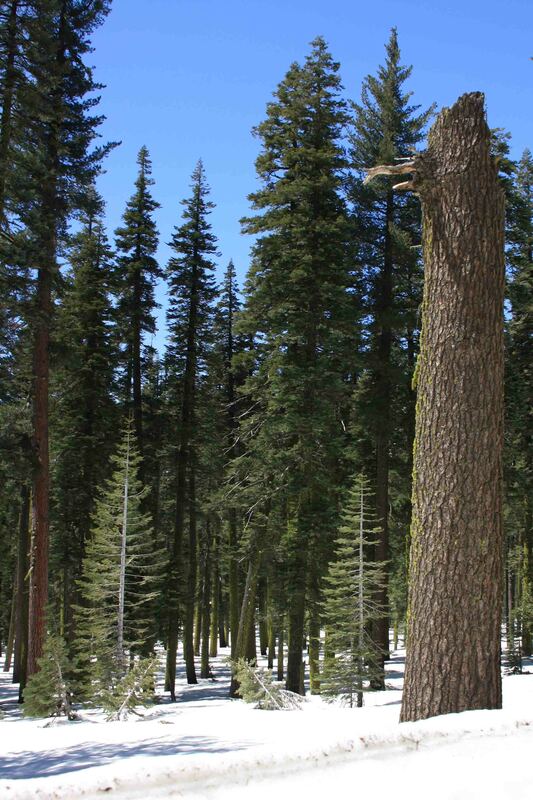 I began to wonder if that meant we couldn’t visit any of the steam vents, boiling mudpots, gaseous fumaroles, or cinder cones situated beneath 10,457 foot Lassen Peak, the park’s tallest volcano. We could get to the entrance; that was it! My book did warn that many alpine routes are closed in winter, but I’d have to poll my reader’s to find out who thinks May 4th is winter!!! I guess I will have to add this park to my list in October. We continued on toward Redding. The quickest route would have been to take 36 east to I-5 and turn north to Redding, but knowing I will be on I-5 for several hours tomorrow as I travel to Yosemite, I thought I’d take a scenic route. We descended 4,500 feet down to 1,000 feet above sea level on 36 before turning north on an extremely winding road that narrowed to one lane bridges a couple of times and climbed close to 3,000 feet in 15 miles. Poor VANilla! We did get to enjoy green fields sprinkled with yellow wild flowers, rolling hills peppered with purple flowering bushes, and lovely views of the valleys below until we reached 44 and continued east another 15 miles or so to Redding where it was 90 degrees! Petey and I stretched our legs as we meandered across the Sundial Bridge to the Sacramento River Trail which led past us past botanical gardens complete with butterflies and deer, beneath shady oak groves, to ponds full of turtles and to other parks as it followed the Sacramento River. I think I may have seen at least three deer a day since I left the coast. 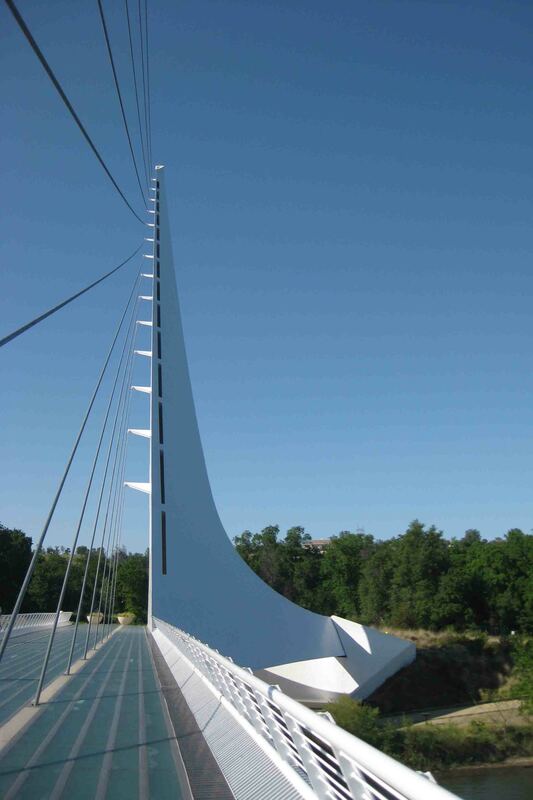 The Sundial Bridge was designed by world-renown architect Santiago Calatrava. He describes it as a goose in flight with the pylon representing a wing. The bridge’s design was so complex it required creating new software to make the engineering calculations. It is the first steel, inclined pylon, cable stayed bridge in the United States. It took eleven years to complete from inception to its grand opening in 2004 and cost $24 million to construct. The 720 foot long bridge includes 2,245 glass panels in its deck that can reach 150 degrees in the summer. The bridge weighs 1,600 tons – the same as 400 elephants. Another interesting site along the trail is remnants of concrete piers in the river which was once the longest conveyor belt in the world. In 1940, the beltline roared overhead 24 hours a day, seven days a week, at 550 feet per minute carrying rock and gravel to the Shasta Dam site. The ten-mile journey took an hour and forty minutes. 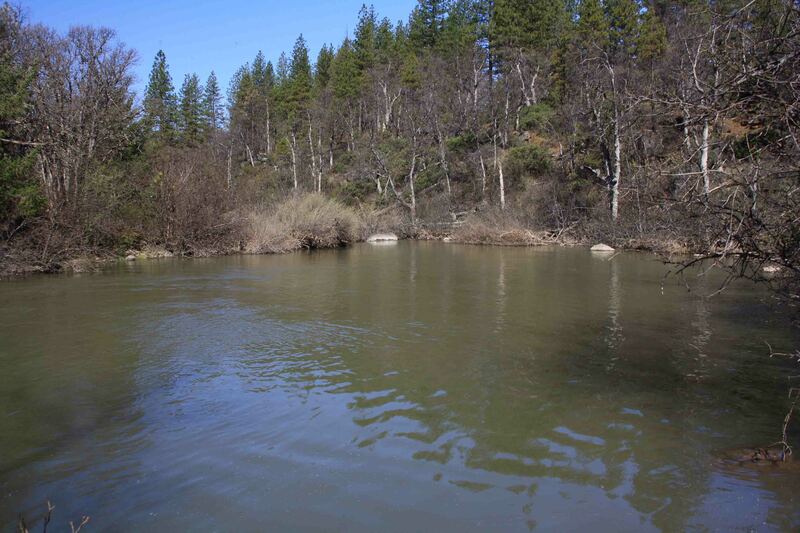 The belt was built at the first bend in the Sacramento River as floods deposited all shapes and size of gravel to be mined. 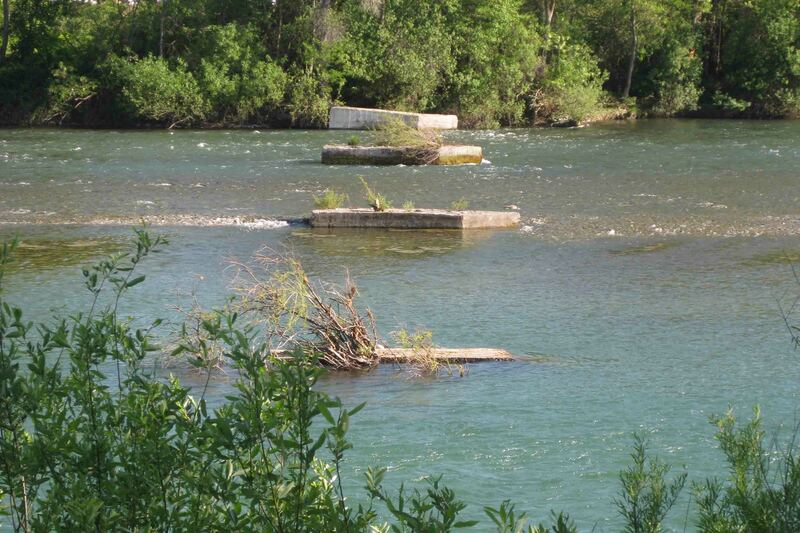 The dam was built to prevent flooding, now prevents gravel from being deposited at the location! After our walk in the heat of the summer in Redding, Petey waited in VANilla while I enjoyed city living and ate at a restaurant! Later I joined him to camp at Turtle Bay Park. ETB. The falls look wonderful. I can definitely see why you would want to sit out there all day.